Orange, yellow, blue and white blooms are chic and sophisticated in our sleek cube vase. 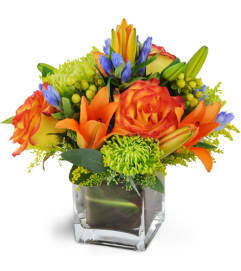 Show your gratitude with big gerbera daisies, unique orange celosia, bicolor roses, blue balloon flowers and white Asiatic lilies. 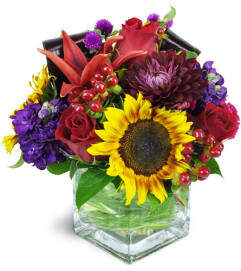 Fabulous for any "Thank You" occasion, this lovely gift will thrill hostesses, clients, and friends alike. Perfect for a birthday - or any day! 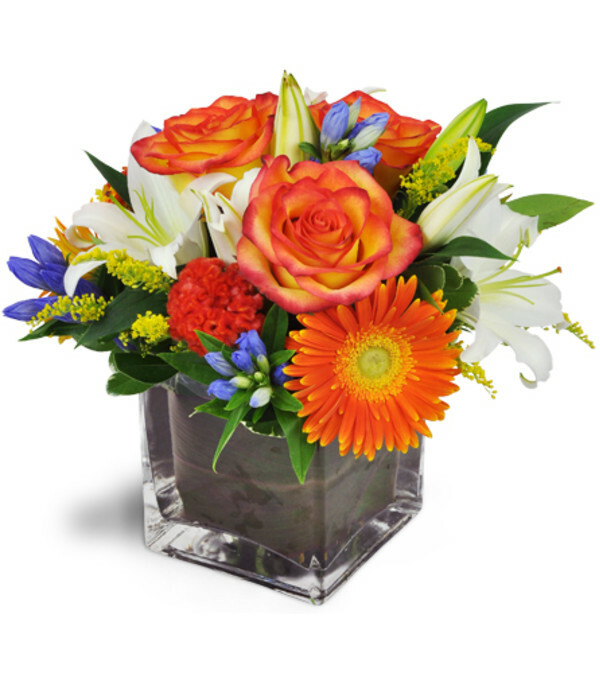 Roses, Gerbera daisies, lilies, and more make a perfectly fun gift! As usual Jenilyn’s has done a wonderful job again. Not only were the flowers beautiful but I know how hard Jenilyn and the other designers work to make each persons arrangement special. Sorry everyone - we can't seem to get this listing updated to show our correct address. The phone number is correct so please give us a call. We are physically located at 57 Virginia Dale Drive, Wetumpka, AL 36092 (however this is actually in the Town of Elmore between Millbrook and Wetumpka). 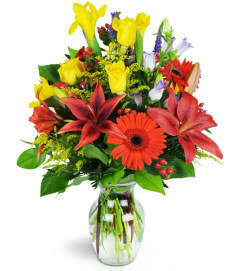 We are the closest florist to the Millbrook area. 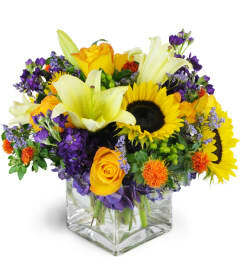 A friend's brother passed away the Friday before Mothers day, having called a few florist in Prattville A.L. (town of funeral home) I couldn't find anyone to help. The people were rude telling me it was Mothers day they were either out of flowers or to busy to fulfill the order for delivery on Monday. As I old one of the florist deaths are not planned so giving a better lead time is ridiculous..Enough of the negative.. I luckily found and called Jenilyns Creations, it was a breath of fresh air to find someone that understood and was very helpful. Do not hesitate make your FIRST call to Jenilyn's when doing business Montgomery AL area and save yourself aggravation. I want to thank Jenilyn's team for doing what they said!!! And the price was more than fair.. Again Great Job Jenilyn's Creations!!!! Jenilyn's Creations is a Lovingly Florist in Wetumpka. Buying local matters. Discover how Lovingly supports local florists. Copyrighted images herein are used with permission by Jenilyn's Creations.